Friend Craig, a member of one of my online parrot groups, who lives in East Anglia in England, writes his 42-year old Senegal parrot Lucy has died. She simply stopped eating and fell off her perch. He says she was the dearest, kindest parrot and never bit him … miraculous for a Senegal parrot. He is distraught. He asks how can one become so attached to a small ball of feathers? Not all parrots are those large blue and gold Macaws you see in movies. Some, like Senegal from Africa are very small. Parakeets, or budgies in some parts of the world, are parrots. Technically parrots are ‘hornbills’ with two toes forward and two toes back. Regular birds have three toes forward and one toe back. They also have softer beaks. Baby, my Senegal parrot is climbing on my chest and shoulder as I write. When he wants me to stop and scritch his head, he runs down my arm and grabs my pinkie finger. So does my other Poicephalus parrot, a female Redbelly named Dory who sits by the keyboard many days and lifts my left pinkie finger when she wants me to stop typing. Poicephalus, the Latin name for Baby’s genus, means head or big head with a big sharp beak. Baby loves it when I firmly rub his big beak between my forefinger and thumb. Poicelphaus senegalus have hard heads. Farmers in Senegal shoot them the way farmers here in the States shoot crows. They are fond of corn on the cob and stalk it seems. Baby has a ball when I put a piece of fresh corn cob with kernels intact in his cage. Unlike most of my other picky parrots, Baby will eat anything. He had a beet root leaf yesterday. The other parrots let the leaves wilt in their cages but he tore his apart, masticated it, and dumped the residual in his water bowl, where it turned it red. Why do we become attached to a small bundles of feathers? Baby is 10 years old and he’s my pal. My friend Lynn’s parrot ET is 32. My concern is not that I will outlive Baby, but that he will outlive me. David says if anything happens, he will take care of the parrots, but he is as old as the Pope. 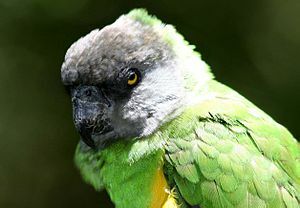 The genus Poicephalus comprises nine species of parrots native to various regions of the Afrotropic ecozone, including Sub-Saharan Africa, ranging from Senegal in the west, Ethiopia in the east, and to South Africa in the south. Several of the species exist in slightly different forms (or subspecies). They are stocky birds with short broad tails and relatively large heads and beaks for their size. (Poicephalus, from the Ancient Greek, literally means made of head). Several of the species show marked sexual dimorphism, where the adult male and female birds can be easily identified from variations in feather colouration, but in other species there is no sexual dimorphism or the differences are not so marked. They feed primarily on seeds, fruits, nuts, and leafy matter. 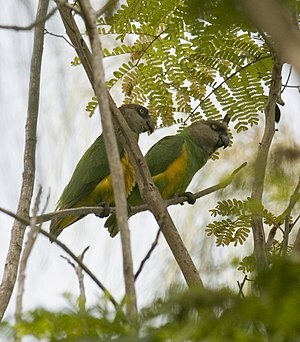 The Cape Parrot and Red-fronted Parrot form a superspecies complex. The Senegal Parrot, Meyer’s Parrot, Red-bellied Parrot and the Brown-headed Parrot are popular as pets because they are easier to keep in apartments, being generally quieter and smaller, than most other companion parrots. Some Poicephalus parrot species are rare and not known or rare in captivity. This entry was posted in Parrots, Retirement Living by SchmidleysScribblins. Bookmark the permalink. We were all heartbroken when one particular gerbil died. She had a real personality and was affectionate. How could we not love her. So sorry for your friend’s loss. And it is a loss. He is quite upset about Lucy’s death. His other parrots are aware she is missing, and trying to comfort him. When I was in High school my family babysat, Pretty Boy for a couple years while his owner was overseas. He wasn’t a Macaw. He had a short tail, green feathers and a nasty disposition. He loved my father, but tried to remove digits from any other human who tried to touch him. I enjoyed him from a distance, but my Dad loved him. That’s so sad. I had NO idea that birds could live so long. 42 years??? That’s incredible. Are all species of birds that smart or are parrots the smartest? Some of the larger parrots live to be almost 100. Yes, I agree with you, I feel so sorry for your friend. Lovely post! My sympathy goes to your friend. We’ve had our sennie for a relatively short time at this point… but he’s really worked his way into our hearts. They all do. I had a parakeet that I kept in a cage in the garage. One day, I came home from work and found both bird and cage gone. I hope the person who stole it has loads of bad luck! Fascinating. I always knew that they were beautiful birds but had no idea parrots were that affectionate. They can become one-person parrots, but I have a Hahn’s Macaw who is loveable to David.